Happy Thanksgiving week! Seven solid days of cooking, eating, shopping (and eating some more) are upon us. Yum! For me, though, this week is special for a different reason entirely: it’s the week I officially begin training for my first half-Ironman! I’m not going to lie, I’ve been thinking about this week a lot – preparing for it, even. It’s one thing to train for a marathon or a shorter-distance triathlon, but 70.3 miles… that’s something I’ve never done. Just a few months ago, the distance was terrifying. Bike 56 miles?!?? Then run a half marathon? How?!? That wasn’t as easy as it sounds! First, I had to decide whether I want to hire a coach, join a training club (or program), or find a free plan online and go it alone. Let’s see: this is my first 70.3, the goal is to finish, and I’m already spending gobs of money on gear (more on that later). Free it is! Some poking around online landed me on this 18-week plan and I very nearly committed to it… but it isn’t 100% right for me. For weeks on end, each swim is 1000 or so yards, and a weekend’s “long run” is 50-80 minutes, peaking at 90. I know the focus in triathlon training is always the bike, but this struck me as not enough. I need more swimming, and I want more running. Then someone recommended these plans and I instantly loved them. But they’re 12 weeks only and, as a newbie, I feel I need more time to prepare. I headed over to the free plan at BeginnerTriathlete.com, but it’s a 20-week program and I’m already only 18 weeks out. Not a problem, I can jump in at week 18, then 12 weeks out, move onto the TriRadar.com plan (which I liked best), with the option to choose between the time-poor or time-rich one, depending on how I feel. And there you have it! A half-Ironman training plan mashup that hopefully works for me! Today’s workouts: a 2,000 yard swim and a 40-minute run; I’ll tell you how they went later. 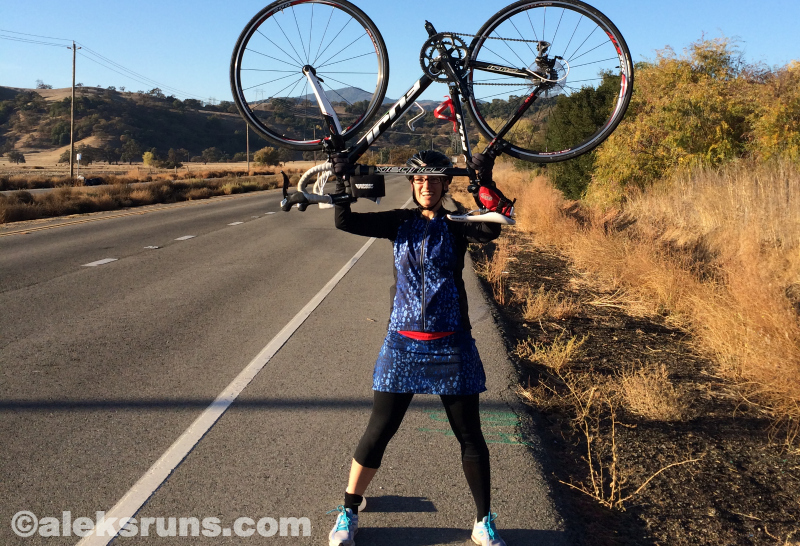 Someone once told me triathletes are gear junkies… and truer words were never spoken. If you’ve never done triathlon and you think you can get away with your old hybrid bike or fixie, your run gear and a pair of goggles, think again (and call me from your bike shop on your 10th visit in so many months so we can have a good laugh at our prior naiveté). If you know of a different model that is good quality and more affordable, I’m all ears! – winter cycling kit. 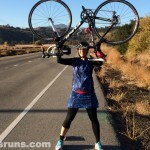 Northern California may offer us year-round short-sleeve running weather, but on the bike, it’s a different world – and a very cold one, if you’re not dressed appropriately. I already have a (pink and fabulous!) windbreaker jacket from Skirt Sports – the so-called Skirt Breaker , which has been indispensable on those chilly, early morning rides. But I was in need of a good pair of long cycling pants (padded, for those 60-80-mile rides), and a long-sleeve cycling jacket would certainly help. Skirt Sports to the rescue! The company actually sent me a Cruiser Bike Knicker Skirt and Long December Top for free to try out, so I’m planning to give you more details in another blog post. But if you know how much I love their skirts and dresses, you’ll probably correctly assume I’m in love with my new cycling outfit, as well! Winter, here I come! 3. I’ve been looking for training buddies. Still in progress! Considered joining a local tri-club, but it isn’t really very “local”: I’d have to drive 20 miles each way to get to their group rides, and won’t even be able to make the time for the swim and run practice because of work. So for now, I’m relying on online groups and riding with HusbandRuns (HusbandRides? ), who doesn’t even own a road bike. Must remedy this problem soon, as HusbandTri-s will very likely be doing Vineman 70.3 with me in July. …and just like that, we’ve come to the last, most important step in the prep for my first-ever 70.3. 4. I registered for my second 70.3!